The Disney Magic returned from its two-week drydock last week with a re-themed restaurant—Carioca's became Rapunzel's Royal Table on deck 3 aft. The restaurant features an immersive dining adventure with food, music,and entertainment inspired by Disney's Tangled movie. 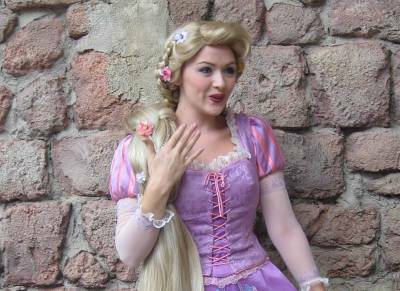 The restaurant has been transformed into a royal ballroom where the King and Queen are celebrating Rapunzel's return home—guests see the Snuggly Ducking Thugs perform and get a visit from Rapunzel herself. Menu items include the Snuggly Duckling Platter (charcuterie), Tangled Pasta (angle hair pasta tossed in basil-pesto), Flynn Rider pork loin, Captain of the Guards roasted prime rib, Rapunzel's Fry Pan Sweet Bread, and warm braided apple strudel. This news bulletin updates page 00 of PassPorter's Disney Cruise Line 2017 LIVE! Guide.